Insights on the Endurance, Technical and Adventure Lifestyle. Day Three: North Korean Operations Slow as Border Holds. 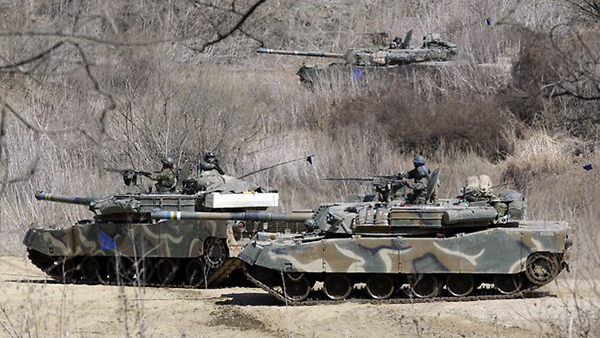 On day three of the conflict U.S. armored units held the border with North Korea south of the former DMZ but did not advance. The constant of warfare is confusion. In a social, political and economic context warfare is a desperate “reset button” that vents societal pressure, absolves an economy and resets political calibration. Clearly there are much better social systems for change, but none is more expedient, more horrible or older than war. The onset of war is oddly predictable, like the laws of inertia. Objects in motion tend to remain in motion until acted upon, and war is that act. It’s the trajectory of what happens after war begins that appears less predictable. At least on the surface. Thomas P.M. Barnett is a scholar and geostrategist. He’s also a man who likes action. In his groundbreaking book, The Pentagon’s New Map he went so far as to compare himself to Tom Clancy’s fictional character Jack Ryan. For most people that would be a laughable and self aggrandizing bit of hubris. But for Barnett, it is a fair comparison. Barnett briefs admirals and generals, congressmen and senators. His ideas, stated simply, are that the world is divided into two groups, the functioning core and the non-integrated gap. The functioning core is the part of the world that is in relative cooperation economically and politically (if not socially). The non-integrated gap is the fragmented detritus of the world’s push toward modern society; the radical religious factions, the economically destitute, the regions outside the global infrastructure. Simplified to its rudiments, people would rather be fed than starving, well than sick, financially secure than impoverished and, in about this order, they want to believe they are free of mind and soul. It is the tendency of human nature. Thrust into the chaos of war the human compass eventually points to the something that more resembles the functioning core than the non-integrated gap. People want good things to be more, and bad things to be less. And so it happened that North Korean Peoples’ Army Jungwi (Second Lieutenant) Kim Jae Ki, an artillery officer who’s communications had been cut off, had been hit by two air strikes and was nursing a unit of mostly damaged 170mm long range self propelled guns made a decision, or rather, a non-decision. He commanded gun crews that were scared, dirty, hungry, sleep deprived and gradually losing their allegiance for The Great Leader. His decision was one of default, hard-wired into the human animal. It is a decision that, in the great mystery of human/animal behavior, is the default of most people. It is also usually fatal. After the initial exchange in war there is often a lull. Each side is attending to the mundane and gruesome logistics of war, reeling from the first exchange. It may be less than an hour, it may be a number of hours. It is seldom any longer in the age of modern warfare. The U.S. had fired most of its cruise missiles in the region and was assessing their effectiveness as a second wave of manned air strikes was either being prepared or beginning. Signals intelligence and reconnaissance analysts were frantically busy tracking North Korean units and assessing bomb damage in the first round of strikes. 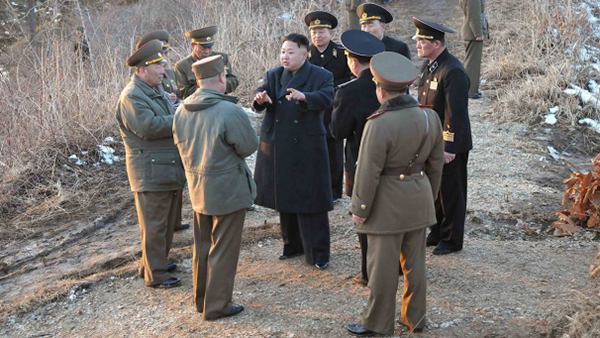 The border between North and South Korea remained intact, no huge armored thrust from either side. There were still artillery duels and numerous tactical airstrikes. The appearance of helicopters in the border area suggested that many of the North Korean anti-aircraft assets had been effectively suppressed. A special intelligence gathering satellite picked up radiological data after the B-2 strike on the nuclear facility at Yongbyon. It would determine the degree of localized radioactive contamination after the reactor was destroyed. And Second Lieutenant Ki continued to wait. Wait for orders, a resupply, another airstrike. Wait for some change. As he waited he took inventory of his unit’s condition and his own mindset. The tabulation wasn’t favorable. Ki also feared an armored thrust from the south at any time, a massive wave of aircraft, tanks and soldiers from the U.S., South Korea and the rest of the world that would roll over him. His mind extrapolated his current circumstance along a similar course to the last 24 hours. Things had gotten bad, they would get worse. Because the social mindset of the North Korean Communist culture was one of the collective and not of the individual Ki was at a loss. He had been trained to cooperate and follow orders. When those orders weren’t available he was not skilled in personal initiative. So he did nothing. Among an increasingly concerned high level military leadership a young and untested Korean leadership attempts to maintain order. It is said that when German commanders in WWII learned of the allied invasion on D-Day they were purposely slow in responding in a kind “passive-aggressive” rebellion. Leaders like Field Marshall Irwin Rommel hated Hitler and wanted him out. One way of assisting the process was to slow their responses and not join the battle with vigor. Gradually, without conspiracy, born from individual nature, the same began to happen in North Korea. Forward line units cut off from resupply and reliable communications began to reduce their tempo of operations. They simply didn’t understand what was going to happen next and they weren’t sure they would do the right thing if they did anything, so they did nothing. Even more ominously for the North Korean leadership, after decades of iron fisted Communism, some North Koreans were beginning to wonder what “the right thing” really was. Second Lieutenant Ki was one of them. Gradually, painfully, the inertia of the conflict began to act on the direction of the outcome. From that direction analysts and strategists extrapolated a probable outcome. And that probable outcome was trending toward the more favorable as the hours ticked painfully by. Remembering Cycling Commentator Paul Sherwen. Is Michigan Bicycle Retail Dying?